Anti-Jewish author; born in Mannheim 1654; died in Heidelberg Dec. 20, 1704. The son of an official in the service of the Elector of the Palatinate, Eisenmenger received a good education, and distinguishing himself at the Collegium Sapientiæ at Heidelberg by his zeal for Hebrew studies, he was sent by the elector to England and Holland to continue them there. In Amsterdam he met three Christians who had been converted to Judaism, and this filled him with indignation. As a further cause of his hatred of Judaism, he claims the otherwise unknown attacks against Christianity which he heard from the mouth of David Lida, then (1681) rabbi of Amsterdam. For nineteen years he studied rabbinical literature assisted by Jews, first in Heidelberg and afterward in Frankfort-on-the-Main, pretending that he desired to be converted to Judaism. Having collected from rabbinical literature all that was calculated to bring it into disrepute and to give justification for anti-Jewish prejudices, he published his "Entdecktes Judenthum" (Judaism Unmasked), which has remained the arsenal for detractors of Talmudic literature down to the present day. The full title of the book is interesting and is given in the facsimile on page 81. The work, in two large quarto volumes, appeared in Frankfort-on-the-Main in 1700, and the prince elector took great interest in it, appointing Eisenmenger professor of Oriental languages in the University of Heidelberg. The Jews, who feared that the publication of this book would give additional strength to the prejudice against them, denounced it as a malicious libel; and the fact that only a year previously riots against the Jews had occurred in the diocese of Bamberg, and that in the same year (July 21) a mob had sacked the house of the court Jew Samuel Oppenheimer in Vienna, made their opposition all the stronger. Oppenheimer was chiefly instrumental in procuring an order of confiscation from the emperor, who commanded that the whole edition of 2,000 copies should be placed under lock and key. With him others worked for the same end, including Jospa von Geldern, the great-grandfather of Heinrich Heine's mother. There was also Roman Catholic influence at work, as Eisenmenger was accused of anti-Catholic tendencies. The Jews had offered Eisenmenger the sum of 12,000 florins ($5,000), if he would suppress his work; but he demanded 30,000 florins, and the transactions led to no result. Eisenmenger died suddenly of apoplexy in 1704. Meanwhile two Jewish converts to Christianity in Berlin had brought charges against their former coreligionists of having blasphemed Jesus. King Frederick William I. took the matter very seriously, and ordered an investigation. Eisenmenger's heirs applied to the king; and the latter tried to induce the emperor to repeal the injunction against the book, but did not succeed. 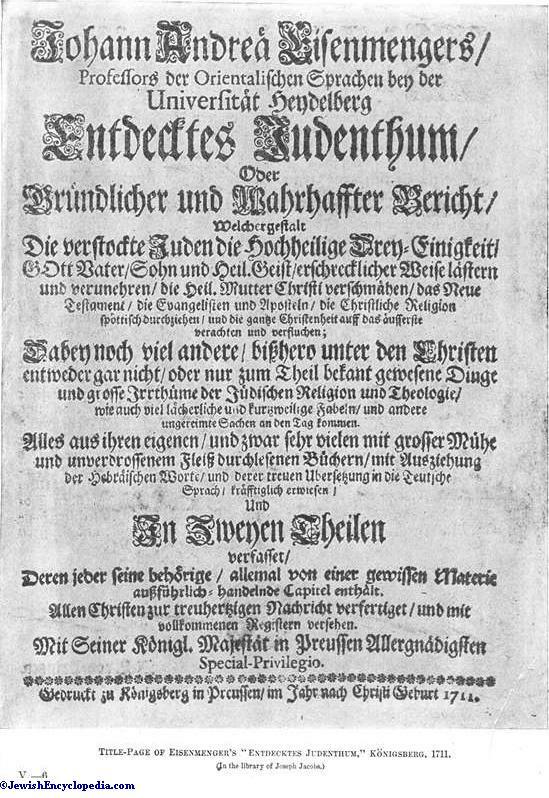 He therefore ordered a new edition of 3,000 copies to be printed in Berlin at his expense, but as there was an imperial prohibition against printing the book in the German empire, the title-page gave as the place of publication KÖnigsberg, which was beyond the boundaries of the empire. Almost forty years later the original edition was released. 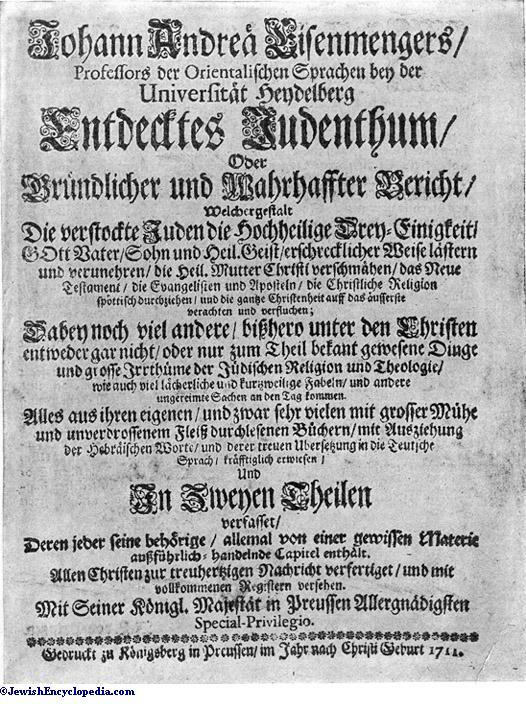 Title-Page of Eisenmenger's "Entdecktes Judenthum," Königsberg, 1711. 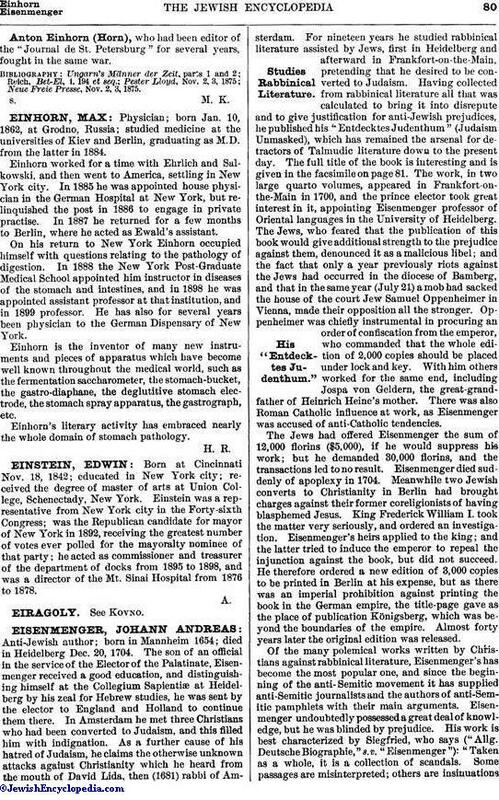 Of the many polemical works written by Christians against rabbinical literature, Eisenmenger's has become the most popular one, and since the beginning of the anti-Semitic movement it has supplied anti-Semitic journalists and the authors of anti-Semitic pamphlets with their main arguments. Eisenmenger undoubtedly possessed a great deal of knowledge, but he was blinded by prejudice. His work is best characterized by Siegfried, who says ("Allg. Deutsche Biographie," s.v. "Eisenmenger"): "Taken as a whole, it is a collection of scandals. Some passages are misinterpreted; others are insinuations based on one-sided inferences; and even if this were not the case, a work which has for its object the presentation of the dark side of Jewish literature can not give us a proper understanding of Judaism." 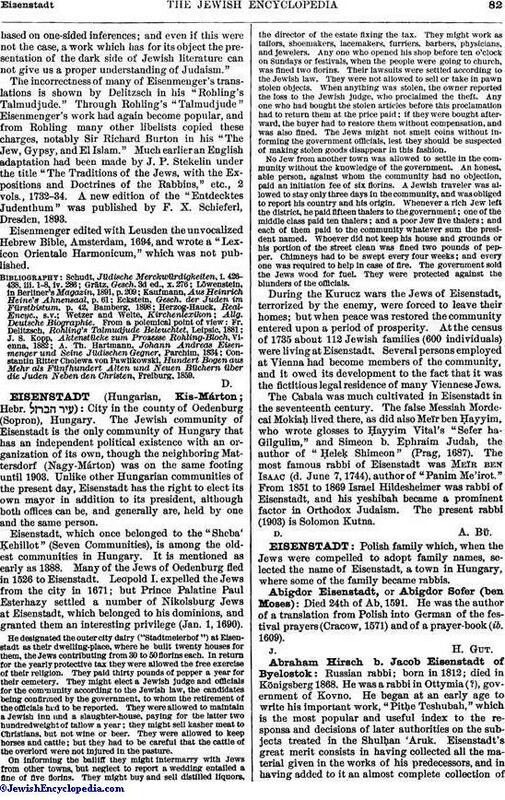 The incorrectness of many of Eisenmenger's translations is shown by Delitzsch in his "Rohling's Talmudjude." Through Rohling's "Talmudjude" Eisenmenger's work had again become popular, and from Rohling many other libelists copied these charges, notably Sir Richard Burton in his "The Jew, Gypsy, and El Islam." Much earlier an English adaptation had been made by J. P. Stekelin under the title "The Traditions of the Jews, with the Expositions and Doctrines of the Rabbins," etc., 2 vols., 1732-34. A new edition of the "Entdecktes Judenthum" was published by F. X. Schieferl, Dresden, 1893. Eisenmenger edited with Leusden the unvocalized Hebrew Bible, Amsterdam, 1694, and wrote a "Lexicon Orientale Harmonicum," which was not published. Constantin Ritter Cholewa von Pawlikowski, Hundert Bogen aus Mehr als Fünfhundert Alten und Neuen Büchern über die, Juden Neben den Christen, Freiburg, 1859.